My practice is based on independent curatorial research and action. It is an unwieldy, nomadic portal, aligning itself with temporary funding structures and institutional allies. It has felt this way from the first projects I explored through my practice as an artist – experimenting with off-site events focused on loosely-formed exhibitions-as-happenings coupled with periodic injections of hospitality – to my current wrestling match managing a curatorial framework that critically engages with the field of art in education. Throughout this shift, I have tried to maintain a circuit of reflection and observation that is focused equally on myself and on the subjects that I encounter – never allowing the context of the projects to lead me towards a generalised format. I founded the curatorial platform Art School in 2014. It focuses on establishing new interfaces between contemporary art and sites of education. Art School is invested in a longer-term enquiry into pedagogical shifts in education through the means of art. It takes place as a series of independent projects, exhibitions, workshop and residency programmes, bringing contemporary artists into educational systems to inspire and expand their teachings. I work alongside strong artists with challenging practices, unpacking their active research and work in primary and secondary school environments. The students who are involved are not merely the audience: they are collaborators in these projects. This is important, as they are society’s future critical thinkers, but are rarely (if ever) given an opportunity to take part in art projects through more than a tokenistic form of engagement or participation, or with strict conformity to a curriculum. Art School operates through the territory of a gap, of an inertia, and because of a lack of opportunity for students to see and engage with contemporary art. 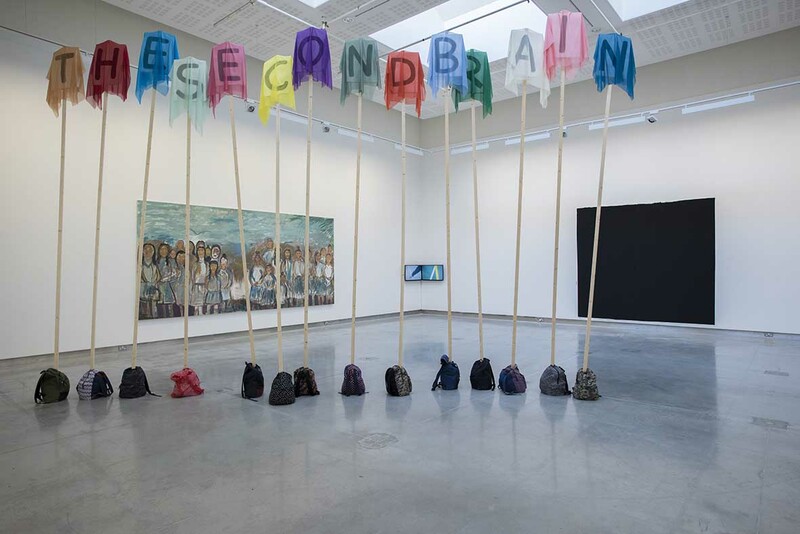 These are things that the Arts in Education Charter, the National Arts in Education Portal and, more recently, Creative Ireland, are also trying to address.1 Art School operates both at the forefront and the periphery of this host of higher-level actions. It is sited now, within a crisis, not as a temporary Band-Aid for a fractured art curriculum, but as a means of curating art actively in times of social and societal ux. This year, I was presented with the challenge of reframing Art School within a formal exhibition space, a challenge which manifested in the exhibition It’s Very New School.2 I want to use this text to consider the ways in which this temporary shift back into the gallery – and back into a more conventional exhibition format – sits alongside a trajectory of more dispersed projects. The exhibition drew significant public and media attention, even though the residencies formed the larger body of work. I suppose this is the nature of exhibitions in general. This approach might form a convenient parallel for other independent practitioners whose projects stray in and out of various institutions and production contexts, particularly in relation to themes that explore contemporary artistic practice and educational reform. Before I go any further, I need to confess that I am suspicious. Things that function well on the surface always draw my attention, as if there will inevitably turn out to be a particularly interesting crack in what otherwise appears to be a uniform surface. The term ‘arts in education’ provokes my curiosity in this way; I am drawn to the field not only because of my interest in direct engagement, but also because of this speculative, obsessive curiosity. There is a tension that is produced as I try to determine how to mobilise this curiosity, as Art School gains momentum. One of the benefits of working independently through Art School is that there is freedom to balance critical perspective with institutional support, and to comfortably observe the relationship between the sustainability of larger-scale, integrated arts-in-education initiatives and the precision of smaller-scale projects that respond clearly to the dynamics of their site, context and audience. Working to articulate this relationship occurs alongside other project work, particularly as there is often a pressure to consider how the instincts of these smaller projects might migrate up the ladder into conversations about how art in education programmes might impact more general curriculum reform. In discussions about the workshop and residency projects that I have curated through Art School, I feel pressured to come up with one-liners about exactly what it is that I am trying to do through this project in order to support this optimism and shift of scale. If I was cornered and had to put all of my ambitions for the project into one short phrase, I might say: it’s about symbiosis; I want artists to be able to effortlessly pass through schools and leave a clear trace amongst the students. Equally, I want artists to take something from the school back out into their world. Strangely this phrase concerning the relationship between artists and students resonates with my ambition for the exhibition It’s Very New School. For this exhibition I invited seven artists: John Beattie, Sarah Browne, Ella de Búrca, Priscila Fernandes, Mark O’Kelly, Maria McKinney and Sarah Pierce. Each artist approached the exhibition’s premise (to explore how art can impact education) from their own perspective and through the specifics of their own practice. Some of the pieces in the exhibition emerged from longer-term artist residencies that I had been working on with the artists in different schools, while others were generated within the confines of It’s Very New School.3 The strength of the works (outside of their own integrity, exhibited in the cube), is that they illustrated paths that the artists were exploring outside of the exhibition, in other dimensions of their own practice. I want to illustrate this through an anecdote from working with one of the artists in the show. These open phrases compelled Sarah’s project forward: from poems, they evolved into the two-channel video installation exhibited at Rua Red. The video material rotates through scenes of the students enacting gestures derived from the poems. This alternates with close pans of the colourful court markings on the floor of the school gymnasium, all propelled by recordings of the students reading the poems. The two screens are set in a corner, so that the synchronised edits immerse the viewer’s peripheral vision. The work documents the process of the artist’s collaborative work with the students, but also emerges as a concise project with its own insularity and integrity. One day during the residency, Sarah and I were driving out to the school and talking about how the work was going. Sarah suddenly mentioned that she had recently performed a noble call for a play called Capitalism: The Musical.6 She had decided to read out the students’ text about things to learn and unlearn. This wasn’t the first time that an artist that I was working with in Art School had communicated that some part of the exchange that took place through their residency had become a part of their work outside of the school. I imagine Sarah reading the lines in front of an audience of strangers, the words of these young students from Killinarden appearing so directly in this entirely unknown context. It’s about getting people to see and experience art. Installing Sarah’s video installation and the six other artists’ works in the exhibition at Rua Red opens this conversation up to yet another audience. I think of how to conceptually minimise the separation between what happens in the gallery, in the school residencies and in the ways that these collaborations manifest in the artists’ practices outside of our time together. I try to conceive of the evolution of the works less through oppositions, such as product versus process; instead I consider all of these divergent outcomes (for the artists, for the students and for the schools) as equivalent trajectories. Situating works within the gallery at Rua Red does not represent an attempt to contain them – it merely suggests a meeting point from which different trajectories emerge. Everyone who has been involved – the artists, the students and the projects’ more expanded communities – can see each other face to face here, standing still for a moment before we move off again along our individual paths. This is how people come up with ideas. The Arts in Education Charter was launched in 2013 and can viewed at: www.education.ie/en/publications. The National Arts in Education Portal was launched the same year as one of the objectives of the charter, and can be accessed at: www.artsineducation.ie. The Creative Ireland Programme for 2017 – 2022 is based on five pillars including “Enabling the Creative Potential of Every Child”, which can be accessed at: www.creative.ireland.ie/enabling-creative-potential-every-child. Mark O’Kelly, Maria McKinney and Sarah Pierce, curated by Jennie Guy for Rua Red Arts Centre in Tallaght (from 3 March to 22 April 2017). larger institutional deficiencies. The exhibition is supported by Rua Red, South Dublin County Council and Wicklow County Arts Office. Sarah Browne worked with Killinarden Community College in South Dublin County supported by South Dublin County Council. Mark O’Kelly worked with Our Lady’s School in Terenure, supported by South Dublin County Council. Sarah Pierce worked with Blessington Community College in Wicklow, supported by Wicklow County Arts Office. John Beattie and Ella de Búrca worked with Dublin 7 Educate Together National School, supported by the Grangegorman Development Agency through …the lives we live public art commission. The list of things to learn and unlearn was generated in artist Sarah Browne’s rst workshop with the students at Killinarden Community School and used to develop a series of poems and the video exhibited in the main gallery. Art teacher: Sarah Edmonsdson. Students: Daiana Belciug, Courtney Boylan, Jamie Byrne, Jade Carkey, Brittany Daly, Rachel Deegan, Orla Dent, Leanne Gallagher, Katie Guerrine, Kelly Healy, Karl Jones, Reece Kinsella, Shane Lee, Meagan Nibbs, Megan O’Keefe, Chloe Russell, Nikki Sullivan and Chloe Tynan. Capitalism: The Musical was written and directed by Deirdre Murphy and performed at the Back Loft, Dublin (November 2016). It’s Very New School curated by Jennie Guy at Rua Red. 2017. Installation documentation. The image shows The Student Body by Maria McKinney, Image of the Self with and Amongst Others by Mark O’Kelley, How to Swim on Dry Land by Sarah Browne, and Ode to the Square by Sarah Pierce.